In the holy land of Kalinga (Orissa) many saints, mystics, and devotional souls have taken birth, from time to time, and have fortified the culture and the spiritualism. The land is witness to most of the important Hindu traditions and spiritual movements. Jewelled by sacred Buddhist monuments to temples of Shakti (the supreme female power), Shiva (the supreme male power), and Jagannāth Vishnu (Lord of the Universe), the state is unique in itself. Most important spiritual rituals have been extensively practised here by several seers - including Buddhist ceremonies, Devi Tantra (tanric rituals involving worship of Shakti), Shaiva Mārg (the path followed by devotees of Lord Shiva), and Vaishnava Mārg (the path followed by devotees of Lord Vishnu). Hardly there is any Sādhak who would not pay a visit to the Shri Jagannāth temple, at least once in her or his lifetime. Among the various great souls, the most prominent (in the domain of the known History) are the Panchasakhaa (=Five friends) who have deeply influenced both the Oriya Spiritualism and the Literature. These five friends lived between 1450 to 1570 AD and enriched the spiritualism in a way that normal man can also understand and benefit out of that. These great souls are: Achyutānanda Das, Ananta Das, Jasovanta Das, Jagannātha Das, and Balarāma Das. They popularly were called as Panchasakhā (=Five friends). Pancha means five and Sakhā means friends -The great spiritual leader and Nāmayogi Avatār Chaitanya Mahāprabhu has referred to these five of his disciples as Panchasakhā and stated that the Panchasakhā are like his Pancha Ātma, i.e., five souls (Atma-Tattva) and are in no way lesser than some of the Avatārs of Shri Vishnu. Shri Chaitanya was the first to establish the Bhāba-Mishrita Nāma Mārga (the path of chanting the holy name with proper feelings and faith); before him this method was not so popular or well-known even if the path is partly described in the ancient Vedas. He first introduced this method for all the simple-minded people and made many realize that God-realization can also be achieved by simpler method of pure devotion without undergoing difficult method of austerities. It is he who first disclosed the importance of the HareKrusna MahāMantra. 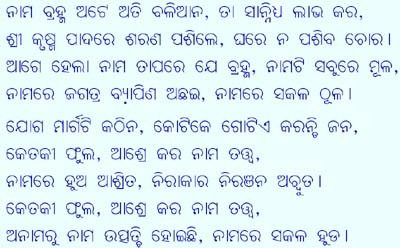 The Panchasakha converted ancient Hindu texts into prose (of simple language) easily understood by the people of Udra Desha (Orissa or Odisha). Shri Achyutānanda Das was the most prolific writer of the Panchasakhās and has written numerous books classified under categories such as Pothi, Mālika, Tikā, Gitā etc., believed not in one life but in many successive lives. He is known as the Mahapurusha, which means - a great man. Mahapurusha Achyutānanda was a Shunya Sādhak and had acquired immense knowledge about almost every aspect, i.e. Spiritualism, Ayurveda (Indian healing medical science that uses only natural resources and herbs), various other sciences, and social regulations. For details please go through the Literature Pancha-Sakha page. There is an interesting belief (school-of-thought) about the origin of Panchasakhā which relates them to the Mahabhārat era (Dwāpara-yuga), and is also stated in Shunya Samhitā written by Mahapurusha Achyutānanda. Here, Mahapurusha describes, Panchasakhā literally means "five mates or friends". Towards the end of Mahabhārat era when Lord Krusna was leaving the mortal body, Nilakantheswara Mahadeva (another name of Lord Shiva, residing in Puri, with a blue-colored neck caused by intake of poison to save the world) appeared and had a conversation with Lord Krusna. He revealed that the Lord's companions Dāmā, Sudāmā, Srivatsa, Subala, and Subāhu would reincarnate in the Kali-yuga and will be known as Ananta, Acyutānanda, Jagannātha, Balarāma, and Yasovanta, respectively. Thus, the believers of the Panchasakhā consider that these five saints were the most intimate friends of Lord Krusna in Dwāpara-yuga, who came again in Kali-yuga to serve Him. They are also instrumental to perform the crucial and much-awaited Yuga-Karma of destroying the sinners and saving the saints, according to the Sanātana-Hindu beliefs. 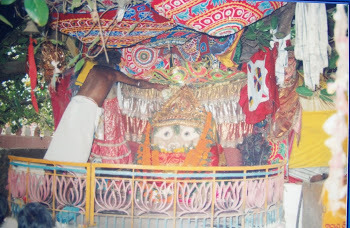 Panchasakhā e mora Pancha Mahanta. !! Shunyaru Khasilaa Pavane Misilā, Anākare Helā Thula !! !! Thula Bhāngigale Athule Misiba, Rahijiba Anāhata !! A succinct descritpion of the appearances and attributes of Pancha Sakha is provided in the video below. Upon request, Pundidt Amareswar quoted a few Shlokas from his retentive memory on 12-Nov-2014 at Kakatpur Pothi Ashram. Mahapurusha Achyutānanda is belived to have been born with special mercy or divine intervention from , which is symbolic for Lord Jagannāth himself (chapter on Vibhuti Yoga, Shrimad Bhagavat Geetā). Hence the name of Mahapurusa is Achyuta ("A + chyuta": A= Shri Visnu; Chyuta = created from). Occasionally, Mahapurusha Achyutānanda is also referred to as Achyuti, which literally means "who has no fall ("chyuti nahin jāhāra" in Oriya language)". Sri Achyuta Das was born to Dinabandhu Khuntia and Padma devi in a village called Tilakona in Orissa in about 1510 AD on a "Māgha Sukla Ekādashi" (a specific time described in Oriya calendar). His parents were childless for a long time and were praying to Lord Jagannāth for a child. One night his father had a vision that Garuda (the bird of Vishnu, an Eagle) gave him a child. Next morning he rushed to the temple and prayed at the Garuda Khamba (a pillar in front of the Jagannāth temple) thanking the Lord for his mercy. At this point there are two different beliefs: some are of the opinion that he (Dinabandhu Khuntia) found a newborn divine child there and he is Achyuta ("A + Chyuta"). Some others believe that, soon after this incident (vision), Padma devi was conceived and was booned with a divine child. Entire creation is spread by Nāma, And everything is contained in Nāma. From Anāma was born Nāma, immerse yourself in Nāma. During this brilliant era of Panchasakhā, another seer His holiness Arakhsita Das (the presiding seer of Olasuni near Paradweep) who was not among the Panchasakhā but was a revered saint, once found a divine child and handed over the newborn child to Mahapurusha Achyutānanada. This child was known as Ram Das who is the disciple of Mahapurusha Achyutananda, Panchasakhā, and Arakhsita Das together. The PanchaSakhā were called as Pancha Guru (five Gurus) and together with Shri Arakhsita Das they were known as Sada-Goswāmi (six Lords). Shriguru Arakhsita Das, a great Shunya Sādhak, is the patron saint and seer in the Olāsuni hills. Olāsuni hill is located near the border of Cuttack and Jajpur district, adjacent to the Daitari- Paradip Express Highway near the Ratnagiri and Laitgiri hills. The Gobari river also flows nearby. Olāsuni hill was the place of Sadhana where Shri Arakhsita Das performed austerities in a cave (Olasuni gumphaa) before attaining salvation. The annual nine day Gumphaa festival of Olāsuni is very famous. There is also the temple of Goddess Olāsuni, near the tomb of Saint Arakhit Das. Baba Buddhanath Das sings in a song that Goddess Olasuni is the mother of Shri Arakhsita Das, one of the greatest ShunyaVādi Sādhakas. He is extremely merciful and accepts every offer, irrespective of any other factor, when they are offered with feelings. Subsequently the Pancha Sakhaa and Arakhsita Das, in Samādhi, could know that in the 13th birth (also the last birth) of this child (Ram Das), all their souls (Atma-Tattva) will remain in Ram Das and he will perform Yuga Karma on behalf of his Gurus during the transition from Kaliyuga to Satyayuga. The devotees and followers believe that His holiness Baba Shri Buddhanāth Das is the last incarnation of Yogi Ram Das and is enlightened by the conscious of his six Gurus.